We are a non-profit 501(c)(3) organization, and operate entirely on monetary support from individual donations and adoption fees. We are dedicated to rehoming pets in need. We are an all volunteer rescue. We believe in integrity, team work and sharing resource with others, be it individuals or other groups. We provide help and hope for people who need to find homes for their pets. If you are in a situation where you need to find a home for your pet call us and let's see if we can help you. We ask a minimum $30 surrender fee if we place the dog in a foster home. All pets are spayed or neutered BEFORE adoption to help end the cycle of homeless pets and euthanization. Adoptions include a $30 training DVD, collar with ID tag. All our pets have had vaccinations, vet examination and microchip. Please call us at 719 528-6590 to find out about our Volunteer Opportunities! You can also download our Application here! 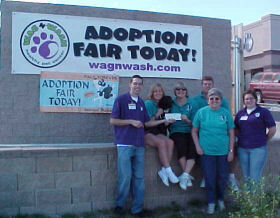 for their help with fostering and unending support! Help us help them by donating! See our Donation Page to find out how!